Mix chicken, cornstarch, salt and white pepper in medium bowl. Cover and refrigerate 20 minutes. Peel outer layer from broccoli. Cut broccoli lengthwise into 1-inch stems; remove flowerets. Cut stems diagonally into 1/4-inch slices. Place broccoli flowerets and stems in boiling water; heat to boiling. Cover and cook 1 minute; drain. Immediately rinse with cold water; drain. Heat wok or 12-inch skillet over high heat. Add oil; rotate wok to coat side. Add chili, brown bean sauce, garlic, sugar and gingerroot; stir-fry 10 seconds. Add chicken; stir-fry about 2 minutes or until chicken is no longer pink in center. Add broccoli and onions; stir-fry about 1 minute or until broccoli is heated through. 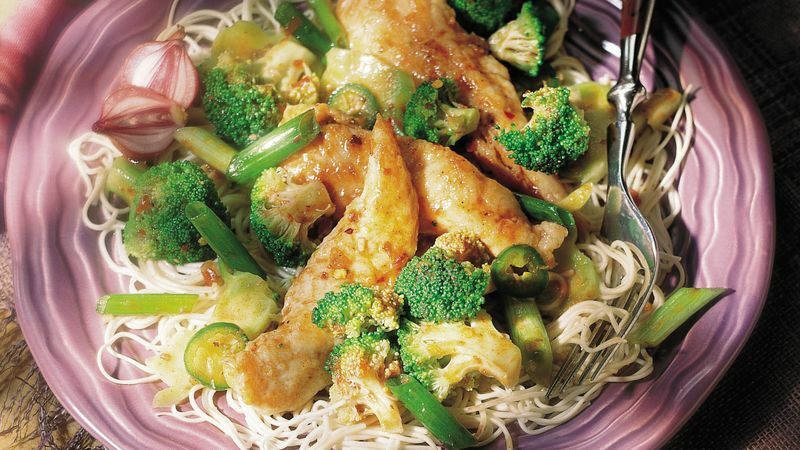 For 9 grams of fat and 250 calories per serving, decrease the oil to 1 tablespoon and use a nonstick wok or skillet. Using minced or ground gingerroot from the jar makes for one less ingredient to chop. Look for it in the produce section of your grocery store. Wear rubber gloves when working with chilies to prevent the burning oils from irritating your skin or eyes. If you prefer a milder taste, cut the chili in half and remove the membranes and seeds before slicing.